Many myths and folklore from different cultures have evolved during experiences such as these I’m going to tell. Depending on the social context and the prevailing belief of the time, anomalous phenomena have been interpreted and oriented in one direction or other (gods, ghosts, fairies, elemental beings, et cetera). Most disconcerting is that the phenomena themselves have accepted these "definitions" and have adapted their manifestation parameters to those "provided" and "designed" by the witnesses themselves. The experiences of which we speak are displayed in a "multivalent" which could allow a wide range of interpretations, depending on our particular personal approach. Even the "encounter with the unknown" could "mutate" (transform) while we perceive (feel) it. It is certainly flexible and interactive phenomena.This is demonstrated in some close encounters with UFOs, which sometimes have integrated features and details (mixed) of different puzzles that are merged (cryptozoology, ghosts, apparitions of the Virgin, et cetera). On November 1, 1954 around 6:30 pm in Cennina (Bucine, Province of Arezzo, Italy) Rossa Dainelli Lotti (40), a woman who lived on a farm on the outskirts of Cennina, was walking to that location to visit the cemetery and church. She carried a bouquet of carnations and walked barefoot so as not to stain her shoes and socks. When she reached a clearing among the trees, she noticed the presence of a strange object that was on the grass. The object was shaped like two cones joined at the base, about 2 m in height and 1 m in diameter and in the center it was brown. The device had a gate and inside could be seen two small chairs. 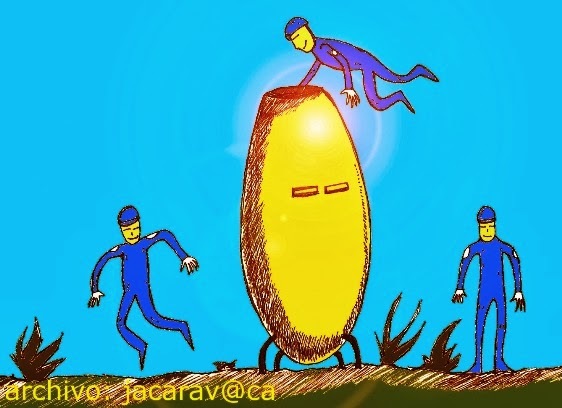 From behind the artifact emerged two small beings, looking like children, 1 m in height, wearing form-fitting overalls, with bright buttons and gray coats. Both had black hair and were wearing red helmets. Their faces like adults, however, and they spoke in a language that the witness compared with Chinese. The two humanoids looked at Mrs. Lotti with great joy and a smile, and one of them looked older than she. They took Mrs. Lotti’s flowers and her socks, throwing them, after an examination, into the object. Then one of the beings took a strange-looking, rounded cylindrical artifact and pointed it at Mrs. Lotti, who ran away thinking that they wanted to photograph her. When she was about 100 m away, she turned and found that that object and people were still there. The encounter lasted about 10 minutes. The event featured testimonials from people who observed a strange object in the air. Two brothers, Marcello and Ampelio (9 and 6 years), said, at the time, they saw, from afar, the meeting of Mrs. Lotti with the two beings. The neighbors who came within 30 minutes of the rare meeting place found a deep hole in the ground about 15 cm with a diameter of 10cm. The hole was also seen by the Chief Inspector of Police in Ambra, Botarelli Zulima, who was hunting in the vicinity when the incident happened. A year before, in Spain there was a close encounter whose intrinsic nature was the same as the same Italian incident. 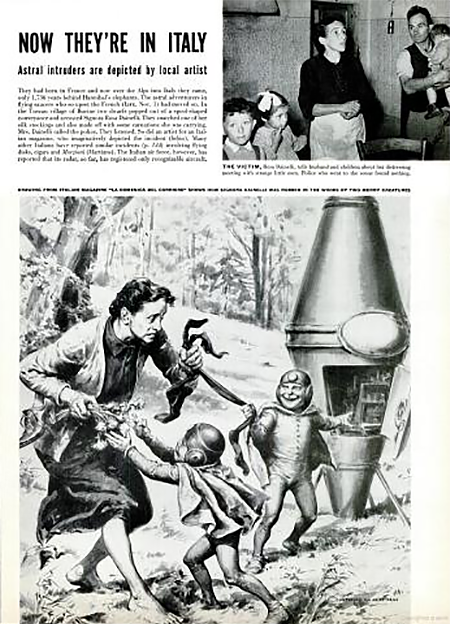 What happens is, that in this case, the perception of the child witness (with a more elemental culture that Mrs Lotti) causes the development of the story (action) and some aspects of the scene (humanoid, nave, uniform), change the nuance, providing simpler, basic details of each and every one of the elements of the apparition. It happened on July 1, 1953, in the small village of Villares del Saz (Cuenca). A young shepherd, Máximo Muñoz Hernaiz 13 years, also encountered a little crew of a UFO. 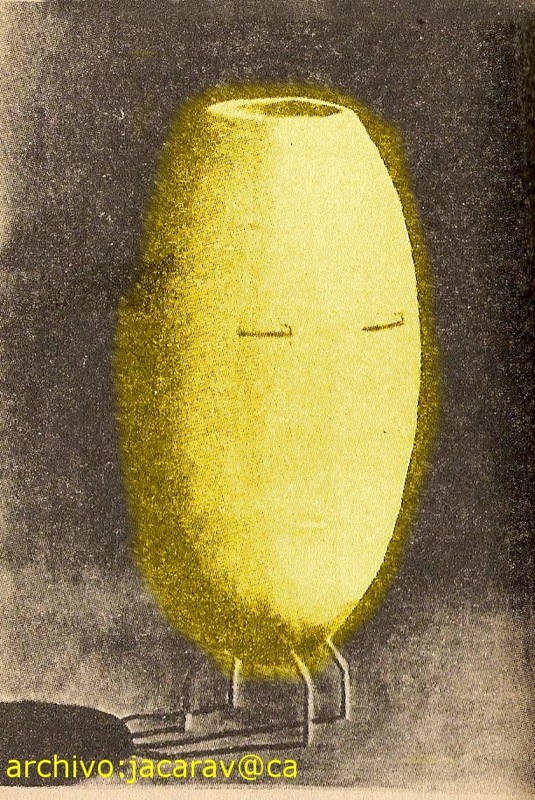 The humanoids, about 70 cm in height, in the words of the witness, had yellow skin, slanted eyes, and were wearing blue, bright clothing and had, on their heads,"caps" with flat visors. Maximo observed that the crew had on their right arms a round plate (perhaps an emblem or symbol that was not distinguishable). The little men were talking in a language unintelligible to the startled witness. Then, the "nice little humanoids," aided by a “step” that was on the engine, climbed nimbly into the aircraft with a bounce. Amid an eerie whistle, the “barrel” started flying, significantly increasing in radiance. Terrified, Maximo took flight. The post commander of the Guardia Civil (military police) went to the site and found four tracks about 5 cm deep and 2.5 cm in diameter. The marks made up a perfect square with 36 cm sides. The researchers talked to more witnesses who said they saw a strange little flying machine, on the date of the Maximo incident. Who can doubt that these cases are "bridges" between UFO experiences and encounters with elemental beings (fairies, gnomes, leprechaun, et cetera) hat were characteristic of past centuries. Small characters, laughing, jumping, with colorful clothes, robbing and pulling pranks. Nothing could be farther from the absurdity of an alleged alien visitation. To date we have tried, unsuccessfully, to complete the "puzzle" of UFOs, Marian apparitions, ghosts, big foot, et cetera separately, believing that they are different phenomena. Let's try to gather all pieces of the " puzzle(s)" and maybe, by "deconstruction" of the anomalous experiences (viewed as a whole), we can contemplate the possibility that the human mind has a role in all of these paranormal "plots." At least we can try.